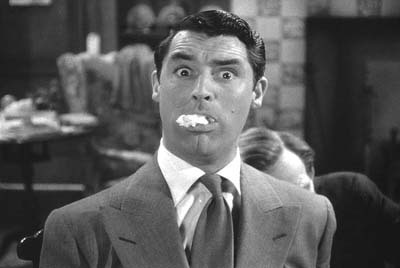 Cary Grant, ladies and gentlemen. It’s been a little quiet around here lately. There’s a good reason for that, and no, it’s not because I poisoned some old gentlemen and hid them in the windowseat. Lo and behold,after a few months of asking people about their day jobs, I have one too. Going forward, I’ll keep most of the details of my work life, like who I work for, names and projects, private. But I’d like to take a moment to think about how, in just a month of working a job—and yep, outside academe—my ideals and daily practices have changed. 1. Part-time is a state of mind. My job, for the time being, is only two days a week. My twenty-two year-old self might have resented a less than full-time gig and clocked in and out accordingly. But I like this job, and eventually I’d like it to be possible for someone to consider hiring me full-time, or even just for more weekly hours. So the time and energy I put in tend to expand—as they do when I sit down to play with a manuscript, or as they did when I dreamed up lesson plans. I have to hold little tribunals with myself about how often it’s okay to check work email on my days off. But I’m certainly not all virtue. The tribunals (made up of my regular self, a version of me with sunglasses and no pants, and a medieval rabbi version of me—what would Freud say) extend to whether it’s really okay to wait until Tuesday to start thinking about that urgent thing that’s due the week after. Does this eat into my writing time? Maybe. Does it also make me feel pretty useful and stave off depression? Probably. 2. Good ideas and smart people are everywhere. I’ve been lucky enough in my life to have experienced several situations where I felt almost spoiled by the talent, goodness, and passion of the people around me. I felt this way as a high school student spending a summer at the Pennsylvania Governor’s School for the Arts (now on long hiatus), a number of times in college, and in graduate school. In these situations, brilliantly engineered by admissions counselors and teachers, people spontaneously created theater projects together, had three-hour dinner conversations with folks they had met that afternoon, and traded work they’d never shown to anyone else. I don’t think it’s an accident that I got to experience this kind of atmosphere multiple times—in fact, I know that I sought to reproduce it in my life again and again. So why should I—why should anyone—expect that just because they’ve left “the bubble” of a great MFA program or community of writers, they can’t find another place where people care about ideas, good conversation, and working on projects whose outcomes they wholly support? My workplace now, I’m happy to say, is full of people who would happily interrupt their data-entry to discuss the work of a 20th century Lithuanian poet, and who listen carefully when someone else has an idea. There’s some luck involved in finding that kind of place, I admit; but it can also be something you actively seek out or even carry around with you. Let me get a little existential here. Like many people I’ve interviewed on this site, I do a lot of writing, editing, and submitting when I can. Nothing much about the way I do that has changed, except that there’s a sense of both urgency and ordinariness to it now—I don’t feel lifted up, promised, the way I did as an MFA student and post-MFA fellow. Writing is something I wake up and do, like going for a run or making coffee or getting on the train to go to work. But where as a student—and even as a younger person with other day jobs—I felt like I had all the time in the world, I usually feel that writing must be done now. There might not be time later, and later my head might be full of something else. I move through the usual good and bad writing feelings (usually: somebody likes me/ nobody likes me/ I am created in the image of the Lord/ I am but dust and ashes), and I try to recognize that whole range of feelings as a possible daily range. Anger is not just for special occasions, and neither is pride. As I continue to “live” this blog–as an MFA with a day job–on a daily basis, I’d also like to hear from you guys: have you taken a job (or two or three) recently, and have you witnessed a shift in your priorities or practices? Positive, negative, or in between, write about it and send it this way, sil vous plait. Over at The New York Times, we get a reminder–did we need one?–that higher ed of all kinds is a means, not an end. All for starting an alt-ac MFA support group on the eastern seaboard, say aye (you’re welcome to do your party-planning in the comments).